British Telecom is marking half a century of transatlantic telephone calls carried beneath the ocean. On 25 September 1956, the first cable connecting the UK and North America "went live". The 2,240-mile cable ran from Gallanach Bay, near Oban in Argyll and Bute, to Clarenville, Canada. It trebled the number of calls that could be made across the Atlantic. The project took three years to complete and cost more than £12.5m. The connection, named TAT1, allowed 36 simultaneous transatlantic conversations. Technology developed during and after World War II helped place the cable and booster stations on the sea bed two miles under the ocean. The main sub-sea link, developed by Bell Laboratories in the US, consisted of two armoured cables, one for each direction. In its first year of service, it carried almost 300,000 calls at a cost of £3 for three minutes. Previous calls had to be made using radio links, which were far less reliable. Hugh Müller, the great-grandson of telephone inventor Alexander Graham Bell, said: "Scotland has a long history of enterprise and involvement in global communications and 50 years of sub-sea cable calls between Britain and North America is a milestone worth celebrating." David Hay, BT's head of heritage and corporate memory, said: "The advent of the first transatlantic cable was hailed as a major breakthrough in telecommunications and heralded the age of reliable and cost effective mass communication across the Atlantic." TAT1 was a joint initiative undertaken by the Post Office Engineering Department, the American Telegraph and Telephone Company, Bell Telephone Laboratories and the Canadian Overseas Telecommunications Corporation. 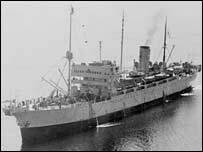 The transatlantic telephone cable was laid by the cableship Monarch, built by the Post Office in 1945. It was the only existing cableship capable of conveying the 1,500 nautical miles of cable, which had to be laid in one piece across the deepest part of the Atlantic. An inaugural ceremony was held at Lancaster House in London at which the postmaster general spoke to the chairman of AT&T in New York and to the Canadian minister of transport. TAT1 ceased service in 1978 but proved a starting point for future research and development. A section of the cable is on display at the Communicate! gallery at the Royal Museum in Edinburgh.